The ‘Engage ’phase begins with lessons that mentally engage students with an activity or question. It captures their interest, provides an opportunity for them to express what they know about the concept or skill being developed, and helps them to make connections between what they know and the new ideas. Provide data for assessment purposes. Each day we behave in particular ways, use particular technologies and manage our school spaces using a variety of resources. We may use energy to keep warm or stay cool; water for drinking and watering; and cars and buses as ways to get from one place to another. The energy and resources we use can release a variety of gases into the atmosphere that trap heat from the sun and cause the earth to warm up. The energy we use in our school, home and cars, the food we eat and the things we buy can all affect how much greenhouse gas we produce. The good news is that we can save energy and water, reduce our school’s running costs and remain comfortable, we can look at our diets and be healthier and we can look at how we make purchases and save money...and all these strategies can reduce greenhouse gases and reduce global warming. Explain to the students that in this unit their challenge is to develop an idea, or project proposal to share with the Principal, school board and others for improved sustainability, adapting to climate change and/or reduced greenhouse gas emissions at the school. What do I know about climate change? How and where will we find out more about climate change and my school, my community and my country? What does it mean to adapt to climate challenges? What does it mean to use resources in a sustainable way? 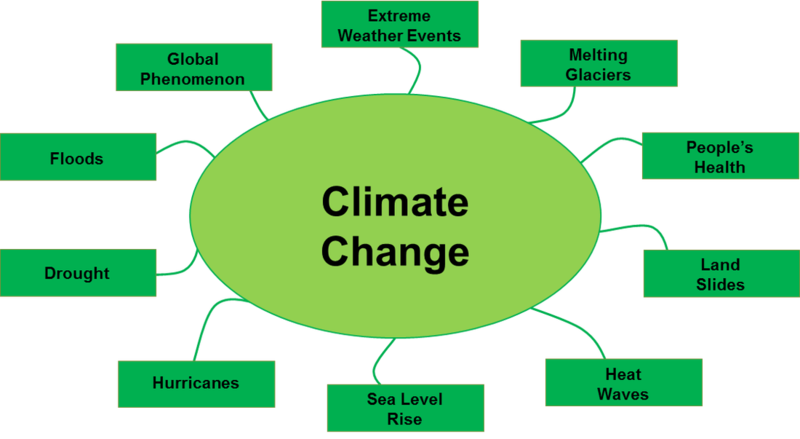 As a class or in groups explore some facts and information about climate change as is currently understood. In groups, explore the issues presented and list ideas concerning understandings about climate change. Ask students to develop a concept map describing what they know about climate change, what it is, what it comprises, what it affects, its potential impacts on living things in a variety of ecosystems, and who and what produces emissions that that can affect the Earth’s climate. Share with students some facts about climate change as is currently understood. Use Simple Mapper at http://simplemapper.org/ or http://www.globaleducation.edu.au/verve/_resources/webmap.pdf to develop a concept map. Concept maps are useful for assessment purposes. Students could complete one at the beginning of the unit and then reconstruct it during and at the end of the unit to demonstrate their changed understandings.